While online course offerings have steadily risen over the last decade and it is estimated that 32% of college students have taken an online course (Allen & Seaman, 2013), the process of preparing students for blended and online courses has varied and is inconsistent across institutions. Attrition rates for online courses have been consistently challenging, but blended courses have offered a promise of engaging students and offering them additional course delivery options. However students may not be prepared for new delivery models. This article reports on efforts of an institutional team that explored what is needed to prepare students for the blended/online course. Included are recommendations for the design of an institutional orientation of blended/online students. McGee, P., Valdes, E. & Bullis, D. (2016). Blended/Online Learner Orientations: Recommendations for Design. International Journal on E-Learning, 15 (2), 215-241. Waynesville, NC USA: Association for the Advancement of Computing in Education (AACE). Retrieved April 24, 2019 from https://www.learntechlib.org/primary/p/48048/. Allen, I.E., Seaman, J., & Garrett, R. (2007). Blending in: The extent and promise of blended education in the United States. Retrieved July 23, 2012 from http://sloanconsortium.org/publications/survey/pdf/Blending_In.pdf. Allen, I.E., & Seaman, J. (2013). Changing course: Ten years of tracking online education in the United States. Babson Survey Research Group and Pearson. Retrieved on January 8, 2013 from http://www.onlinelearningsurvey.com/reports/changingcourse.pdf. Allen, I.E., & Seaman, J. (2011). Going the distance: Online education in the United States, 2011. Babson Survey Research Group and the College Board. Retrieved on August 10, 2012 from http://sloanconsortium.org/publications/survey/going_distance_2011. Allen, I.E. And Seaman, J. 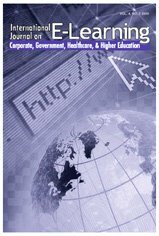 (2009) “Learning on Demand: Online Education in the United States, 2009,” Seventh Annual SLOAN-C Survey, retrieved on December 14, 2012 from http://sloanconsortium.org/publications/survey/pdf/learningondemand.pdf. Allen, I.E., Seaman, J., & Garrett, R. (2007). Blending in: The extent and promise of blended education in the United States. Newburyport, MA: The Sloan Consortium. Allen, M. & Sites, R. (2012). Leaving ADDIE for SAM: Faster, better learning product development. Alexandria, VA: ASTD Press. Angelino, L.M., Williams, F.K., & Natvig, D. (2007). Strategies to engage online students and reduce attrition rates. The Journal of Educators Online, 4 (2), 1-14. Retrieved June 12, 2012 from http://www.thejeo.com/Volume4Number2/Angelino%20Final.pdf Artino, A.R., Jr., & Jones, K.D., II. (2012). Exploring the complex relations between achievement emotions and self-regulated learning behaviors in online learning. Internet and Higher Education, 15(3), 170-175. Bozarth, J., Chapman, D.D., & LaMonica, L. (2004). Preparing for distance learning: Designing an online student orientation course. Educational Technology& Society, 7 (1), 87-106. Retrieved on June 19, 2012 from http://www.ifets.info/journals/7_1/ Ets_7_1.pdf#page=92. Bozarth, J., Chapman, D.D., & LaMonica, L. (2004). Preparing for distance learning: Designing An online student orientation course. Educational Technology& Society, 7 (1), 87-106. Brigance, S.K. (2011). Leadership in online learning in higher education: Why instructional designers for online learning should lead the way. Performance Improvement, 50 (10), 43-48. Carr, S. (2000). As distance education comes of age, the challenge is keeping the students. The Chronicle of Higher Education, 23, A39. Retrieved on June 21, 2012 from http://chronicle.com/article/As-Distance-Education-Comes-of/14334. Cercone, K. (2008). Characteristics of adult learners with implications for online learning design. AACE Journal, 16 (2). 137–159. Chen, C.C., & Jones, K.T. (2007). Blended learning vs. Traditional classroom settings: Assessing effectiveness and student perceptions in an MBA accounting course. The Journal of Educators Online, 4 (1). Considine, D., Horton, J., & Moorman, G. (2009). Teaching and reaching the millennial generation through media literacy. Journal of Adolescent and Adult Literacy, 52 (6), 471481. Dabbagh, N. (2007). The online learner: Characteristics and pedagogical implications. Contemporary Issues in Technology and Teacher Education, 7 (3), 217-226. Dahlstrom, E. (2012). ECAR study of undergraduate students and information technology, 2012 (Research Report). Louisville, CO: EDUCAUSE Center for Applied Research. Retrieved December 6, 2012 from http://www.educause.edu/ecar. Del Valle, R., & Duffy, T.M. (2009). Online learning: Learning characteristics and their approaches to managing learning. Instructional Science 37, 129-149. DiLullo, C., McGee, P., & Kriebel, R. (2011). Demystifying the millennial student: A reassessment in measures of character and engagement in professional education. Anatomy Science Education, 4 (4), 214-216. Dray, B.J., Lowenthal, P.R., Miszkiewicz, M.J., Ruiz-Primo, M.A., & Marczynski, K. (2011). Developing an instrument to assess student readiness for online learning: A validation study. Distance Education, 32 (1), 29-47. Dykman, C.A., & Davis, C.K. (2008). Online education forum--part three: A quality online educational experience. Journal of Information Systems Education, 19 (3), 281290. Education Dynamics. (2009). Many online learners never seek help before dropping out. Retrieved on December 12, 2012 from http://www.educationdynamics.com/News/ Press-Releases/2009-Press-Releases/EducationDynamics-Survey--Many-OnlineLearners-Nev.aspx. Epper, R., Derryberry, A., & Jackson, S. (2012). Game based learning: Developing an institutional strategy. EDUCAUSE Center for Applied Research (ECAR), Research Bulletin. Boulder, CO: EDUCAUSE. Retrieved on October 17, 2012 from http://www.educause.edu/library/resources/game-based-learning-developing-institutionalstrategy. Flood, J. (2002) Read all about it: Online learning facing 80% attrition rates. Turkish Journal of Online Distance Education, 3 (2). Retrieved June 21, 2012 from http://tojde. Hart, C. (2012). Factors associated with student persistence in an online program of study: A review of the literature. Journal of Interactive Online Learning, 11 (1), 19-42. Hiltz, S.R., & Turoff, M. (2005). Education goes digital: The evolution of online learning and the revolution in higher education. Communications of the ACM, 48 (10), 59-64. Holder, B. (2007). An investigation of hope, academics, environment, and motivation as predictors of persistence in higher education online programs. Internet& Higher Education, 10 (4), 245-260. Hussin, H., Bunyarit, F., & Hussein, R. (2009). Instructional design and e-learning: Examining learners’ perspective in Malaysian institutions of higher learning. Campuswide Information Systems, 26 (1), 4-19. Iverson, K.M., Colky, D.L., & Cyborant, V. (2005). E-learning takes the lead: An empirical investigation of learner differences in online and classroom delivery. Performance Improvement Quarterly, 18 (4), 5-18. Kanuka, H. (2006). Instructional design and eLearning: A discussion of pedagogical content knowledge as a missing construct. E-Journal of Instructional Science and Technology, 9 (2). Retrieved on November 23, 2012 from http://www.ascilite.org.au/ajet/e-jist/docs/vol9_no2/papers/full_papers/kanuka.htm. Keller, J.M. (2010). Motivational design for learning and performance: The ARCS model approach. NY, NY: Springer Publishing Co.
Levy, Y. (2007). Comparing dropouts and persistence in e-learning courses. Computers& Education, 48 (2), 185-204. Lim, T., & Abas, Z.W. (2009). The need for learners to understand their readiness for open and distance learning. Presentation at SEAAIR 2009, Penang, Malaysia. Lorenzi, F., MacKeogh, K., & Fox, S. (2004). Preparing students for learning in an online world: An evaluation of the Student Passport to ELearning (SPEL) model. Third EDEN Research Workshop, Oldenburg, Germany. Retrieved June 19, 2012 from http://www.eurodl.org/?p=archives & Year=2004 & Halfyear=1 & Article=108. McGee, P. (2002). Distance learning supports: The intentionality of pre-assessment surveys. Paper published in the proceedings of the 6th Annual E-learn Conference. Montreal, Canada. McGee, P. (2001). Novice distance learners: A Web-based simulation-game orientation. Technical Report written for the Joint Advanced Distributed Learning Co-Lab. Orlando, Florida. Available at http://faculty.coehd.utsa.edu/pmcgee/DLMcGee.rtf. McGee, P., & Anderson, M. (2013). Project realities: Shifting course delivery method. In Benson, A.D., Moore, J.L., & Van Rooji, S.W. (Eds.) Research on Course Management Systems in Higher Education (pp.114-133). Hersey, PA: IGI Global. McGee, P., & Reis, A. (2012). Blended course design: A synthesis of best practices. Journal of Asynchronous Learning Networks, 16 (4). Available from http://jaln.sloanconsortium.org/index.php/jaln/article/view/239. Park, J.Y. (2011). Design education online: Learning delivery and evaluation. International Journal of Art& Design Education, 30 (2), 176-187. Rocco, S. (2007), Online assessment and evaluation. New Directions for Adult and Continuing Education, 113, 75–86. Scagnoli, N.I. (2001). Student orientations for online programs. Journal of Research on Technology in Education, 34 (1), 19-27. Simpson, O. (2006). Predicting student success in open and distance learning. The Journal of Open, Distance and e-Learning, 21 (2), 125-138. Smith, P.J. (2005). Learning preferences and readiness for online learning. Educational Psychology: An International Journal of Experiential Education, 25 (1), 2-12. Squire, K.D. (2006). From content to context: Videogames as designed experiences. Educational Researcher, 35 (8), 19-29. Stanford-Bowers, D.E. (2008). Persistence in online classes: A study of perceptions among community college stakeholders. MERLOT Journal of Online Learning and Teaching, 4 (1). Retrieved on June 20, 2012 from http://jolt.merlot.org/vol4no1/stanford-bowers0308a.htm. Street, H. (2010). Factors influencing a learner’s decision to drop-out or persist in higher education distance learning. Online Journal of Distance Learning Administration, 8 (10). Retrieved on June 21, 2012 from http://www.westga.edu/~distance/ojdla/winter134/street134.html. Sweller, J., van Merrienboer, J., & Paas, F. (1998). Cognitive architecture and instructional design. Educational Psychology Review, 10 (3), 251-296. Tabor, S. (2007). Narrowing the distance: Implementing a hybrid learning model for information security education. The Quarterly Review of Distance Education, 8 (1), 47-57. Tyler-Smith, K. (2006). Early attrition among first time eLearners: A review of factors that contribute to drop-out, withdrawal and non-completion rates of adult learners undertaking eLearning programmes. MERLOT Journal of Learning and Teaching, 2 (2). Retrieved on June 20, 2012 from http://jolt.merlot.org/vol2no2/tyler-smith.htm. Vaughan, N. (2007). Perspectives on blended learning in higher education. International Journal on ELearning, 6 (1), 81-94. Zhang, Y. (2005). Distance learning receptivity: Are they ready yet? The Quarterly Review of Distance Education, 6 (1), 45-53.